Our AirPatrol WiFi Smart Control for AC’s was recently featured in the August 2016 edition of HVAC&R Nation. AirPatrol is a wireless controller designed to help homeowners save money and energy by enabling them to manage their mini-split type air conditioners or heat pumps from a smartphone. 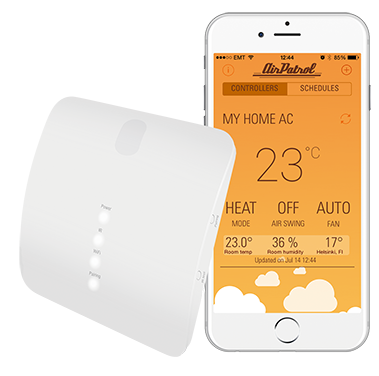 AirPatrol produces wireless control solutions that can be used with air conditioners and heat pumps from all major manufacturers. Setting up AirPatrol controllers is done by installing the AirPatrol app on their iOS or Android device. Then, the palm-sized controller is paired with the home AC, using WiFi. The app aims to provide control over home energy use, allowing customers to adjust room temperature, fan speed, and other settings on the go. Secondly, it provides information about what’s going on at home. 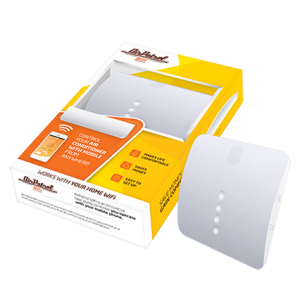 AirPatrol controller notifies homeowners of extreme temperatures, humidity levels, and reminds them when an AC unit needs servicing. To view the article please visit the HVAC&R Nation website. To purchase, please visit our AirPatrol WiFi Smart AC Controller website.